There’s no question that security is important in a dorm room setting. With so many people coming and going, it’s easy for small items of value to simply disappear. A good personal safe can go a long way toward preventing that from happening, but it needs to meet certain requirements. Because dorm rooms are often relatively small and cramped, the ideal safe must be small. It should also have a means of tethering to a sturdy object so that it can’t simply be carried off. The Stack-On PS-508 markets itself as the ideal safe for college students to protect laptops and other items, but can it really do the job? Read the review to find out. The most immediately striking feature of the Stack-On PS508 is its extra-wide design and is the roomiest safe in the ones I have tested. It’s intended to support the storage of a full-sized laptop, and at 14.6 by 20.5 by 8.0 inches, it can indeed accommodate most laptops, tablets and other electronic devices. My 16″ laptop easily fits inside of this safe with lots of room to spare. The body is constructed from welded steel, with pry-resistant doors and concealed hinges for added security. The lock is operated by an electronic keypad with a manual key override with two steel bolts keeping intruders at bay. The bottom of the safe is padded with egg-crate foam to help protect fragile electronics and other items and was the nicest padding of all of the safes I have tested. Included with the safe are the instructions, keys, batteries and mounting hardware that you won’t be able to use in a dorm room. 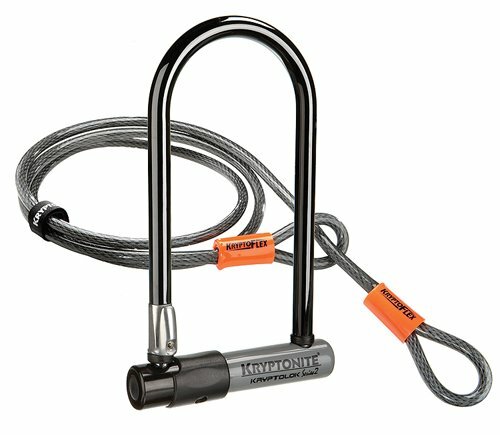 To secure the safe to something solid, you will need to also purchase a cable lock. While I prefer the MasterLock 1519D due to it’s thicker cable, it won’t fit through the holes in the back of the safe. You are either left with the option of drilling larger holes (be sure to paint over the bare metal to keep the safe from rusting) or using the Master Lock 8417D Python Adjustable Locking Cable. The cable is a bit thinner and you will have to use a key to unlock it. The Stack-On PS508 utilizes an electronic keypad lock, which can be programmed with a custom passcode of between three and eight digits. A backup key is also included to open the safe manually. Simply pry off the cover next to the keypad with your fingernail or flat head screwdriver to access the key lock, insert the key and turn. The keypad also includes an option to toggle sounds on or off when a key is pressed. I personally found the beep to be a bit loud for my taste. Fortunately it’s simple to turn the beep off by entering the code *633. To turn it back on, enter the code *66. For additional security, the safe features a time-out period after three successive incorrect passcode entries. A low battery indicator above the keypad provides a notification when the batteries should be changed. Entering the passcode on the keypad electronically triggers the two large locking bolts to open the safe. If an incorrect code is entered three times the safe will lock out for 20 minutes before you can try again. This safe features an indicator on the front to warn of low battery life. The manufacturer claims the batteries will be good under normal use for 1 year, so I would recommend replacing at the beginning of each semester. When the batter is low, a red light will come on to warn you that the battery is low. The red light is located just above the number pad. This safe also allows to test the batteries. To replace the batteries, just open the battery panel located on the safe door and put in some fresh batteries. The Stack-On PS-508 is well-constructed, and the 16-gauge steel body and five-eighths-inch locking bolts provide solid protection. The electronic keypad is quick and easy to use, and the automatic time-out period after three failed passcode entries is a very welcome safety feature. The interior of the safe is relatively spacious, and its exaggerated width makes it ideal for storing laptops and other electronic devices that may not fit in other safes. It’s small enough to fit under most beds, but with a relatively lightweight, easily portable design it should be bolted down or tethered to a sturdy object for additional security. I felt the PS508 is the best proportioned safe out of all of the ones tested. The wide arrangement was the most useful as college students in general don’t have many tall items and makes it easier to hide under a bed or in a closet. Although the PS508 is generally well-made, there are a few flaws of note. The door is recessed to resist prying and the hinges are hidden, but the unit can still be opened through brute force. Additionally, though connected to an all-steel locking assembly, the knob on the front of the door is itself made from plastic. As such, it’s vulnerable and prone to breaking either by deliberate force or through repeated use over time. It’s also possible to bypass the electronic keypad lock and manually open the door with some simple tools and basic knowledge. Although the average person is unlikely to pose a threat, this could leave the safe and its contents vulnerable to a more committed thief. 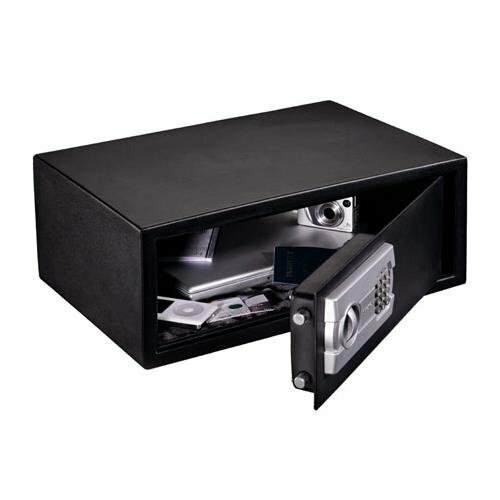 Nonetheless, the safe is well-constructed and offers a higher degree of security than many other safes in its price range. The Stack-On PS508 safe was the best safe for my needs and in my room. The extra wide, and lower profile safe fit perfectly under the bed and gives a ton of room for my laptop, tablet, wallet and other items.